تسهیل و اتوماسیون فرآیند بازسازی بصری و هندسی یکی از مسائل مورد توجه در زمینه مدل‌سازی محیط اطراف خصوصاً در مناطق شهری می باشد. یک دوربین استریو، با توجه به اینکه موقعیت دو عدسی آن نسبت به یکدیگر ثابت است، می تواند در تسهیل فرآیند مدل سازی مورد استفاده قرار گیرد. در این مقاله نشان داده می شود که چگونه با استفاده از داده های کالیبراسیون دوربین استریو، می توان بدون نیاز به تناظریابی خصوصاً در مناطقی که دارای کمبود محتوای اطلاعاتی بالا جهت تناظریابی می باشند، مدل سه بعدی محیط را تولید نمود. همچنین با بکارگیری اطلاعات کالیبراسیون دوربین، نحوه استخراج اطلاعات هندسی و تولید مدل عمق از محیط بدون نیاز به تعریف طول معلوم بین عوارض محیط بیان شده است. در ادامه این مقاله، نتایج بررسی های عملی و بازسازی های صورت گرفته در محیط شهری،مورد ارزیابی قرار گرفته است. Facilitation and automation of the process of visual and geometric reconstruction is one of the issues considered in 3D modeling of environment, especially in urban areas. Since the positions of the lenses of a stereo camera are fixed relative to each other, it can be used to facilitate the modeling process. This article shows that producing 3D environment model can be facilitated by using stereo camera calibration data without the needto matchthe process, especially in the areas where the matching has problem because of insufficient information required. Moreover, using camera calibration information, geometric information and depth map of the environment can be extracted and produced without the need to define the specified scale between features. The results of practical studies and the reconstruction done in the urban environment were assessed later in this paper. 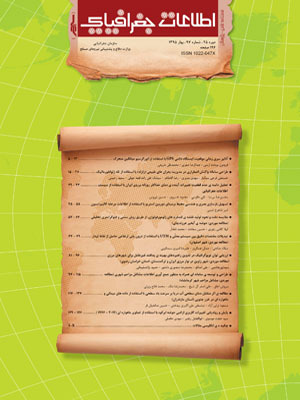 1- امن‌زاده، م.، سعادت‌سرشت، م. و امینی، ا. ش. (1390). «ارائه روشی بهبود یافته برای کالیبراسیون دوربین‌های استریو»، نشریه علمی-پژوهشی علوم و فنون نقشه‌برداری، دوره اول شماره 3. 2- Cabral, E., Oliveira, P. and Junior, J. (2008). "An Omnidirectional Stereo Vision System". ABCM Symposium Series in Mechatronics, pp. 643-652. 3- Chen, S. E. (1995). "QuickTime VR – An Image-Based Approach to Virtual Environment Navigation", 22nd Annual Conference on Computer Graphics and Interactive Techniques, SIGGRAPH 95, pp. 29-38. 4- Cobzas, D., and Zhang, H. (2001). "Mobile Robot Localization using Planar Patches and a Stereo Panoramic Model", Vision Interface, pp. 94-99. 5- Gledhill, D., Tian, G. Y., Taylor, D. and Clarke, D. (2004). "3D Reconstruction of a Region of Interest using Structured Light and Stereo Panoramic Image", IEEE Eighth International Conference on Information Visualization, pp. 1007-1012. 6- Gledhill, D. (2009). "3D Panoramic Imaging for Virtual Environment Construction". PhD Thesis for the degree of Doctor of Philosophy, School of Computing and Engineering, the University of Huddersfield, UK, 149 pages. 7- Gledhill, D., Tian, G. Y., Taylor, D. and Clarke, D. (2003). "Panoramic Imaging—a Review", Computers & Graphics, Vol. 27, pp. 335-345. 8- Huang, H. C. and Hung, P. (1997). "SPISY: The Stereo Panoramic Imaging System", Third Workshop on Real-Time and Media Systems, Taiwan, pp. 71-78. 11- Seedahmed, G. H. and Habib, A. F. (2002). "Linear Recovery of the Exterior Orientation Parameters in a Planar Space", ISPRS Congress, Commission III, WG III/I. 12- Varshosaz, M. and Amini, A. Sh. (2007). "Stereo Panoramas: Problems and Solutions", XXI International CIPA Symposium, Athens.